Being an Adult as a Child. Parentification Explained. Take a minute to think back to when you were growing up. What did your relationship with your parents look like? Do you have memories of your parents being there for you? Did they take care of you when you fell off your bike, or comfort you when you were being picked on at school? Or do you find yourself having memories of the reverse? Do you remember having to take your sibling to school because your mom couldn’t get off the couch, or scratching your dad’s back while he complains about the fight he just had with your mom? If you find yourself primarily relating to the latter, you may have been parentified as a child. According to Englehardt (2012), parentification takes place when an individual takes on parental responsibilities. Now, it is important to note that experiencing parentification as a child can be a normal process. As children grow up, they generally take on more responsibilities, such as doing chores around the house, or being responsible for their own homework assignments. Parentification becomes an issue when the boundaries are pushed too far, and children begin to feel overwhelmed by the amount of responsibilities they hold. In severe cases, roles reverse, and instead of the child depending on their parent, the parent now feels dependent on their child for emotional support or to take care of physical tasks. Parents parentify their children when they are unable to manage these things on their own. For example, they may be too busy as a single parent, missing out on an emotional connection from their partner, or unable to manage responsibilities due to substance use or mental illness. Unfortunately, this often leads to their children missing out on “normal” childhood. Accepting a large amount of responsibility as a child can cause a negative impact transitioning from childhood into adult life. Parentified children often do not gain the opportunity to understand who they truly are. Some learn that they are not fully capable of managing the responsibilities forced upon them, and they may begin to feel that they will never be good enough. These childhood feelings often lead to adult feelings of anger, anxiety, poor self-esteem, and feeling an overall sense of mistrust in peer and romantic relationships (Englehardt, 2012). Parentified children also often continue the role of caretaker into adulthood. This includes over-functioning, perfectionism, and catering to the needs of others in their life, while often disregarding their own. Since they experience this throughout most of their lives, parentified children may see these feelings as personality traits and since they were unable to form a sense of identify, they may feel as if it’s “just who they are.” Luckily, healing from the negative impacts of parentification is possible. The healing process may begin by exploring family of origin. It is important to recognize the relationships and roles within a family, and recalling the ways in which parentification took place. Understanding these elements of family of origin can help in acknowledging the hurt that was experienced, and work toward noticing authentic thoughts, feelings, and needs. Ultimately, the goal is to feel a sense of forgiveness for not receiving the care and the childhood that they deserved. The traits that stem from parentification can be worked on after healing through interventions such as setting boundaries. It is important to note that healing from the negative impact of parentification is not necessarily an easy journey. It is a challenging progression of understanding and processing difficult parts of yourself and your family, which you may have not recognized as an underlying issue. 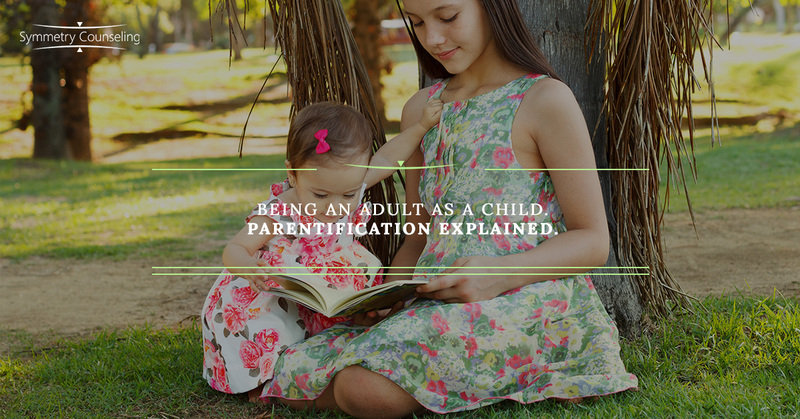 If you feel that you identify with the aspects of parentification outlined above and would like to initiate work on understanding how parentification has affected you, it may be helpful to connect with a therapist. Contact Symmetry Counseling to be matched with one of our talented clinicians. Engelhardt, J.A. (2012). The developmental implications of parentification: Effects on childhood attachment. Graduate Student Journal of Psychology, 14, 45-52.